High-quality feed produces high-quality results. That’s why at Premier Ag’s Hay & Feed Outlet we have all of our hay professionally analyzed so our clients know exactly what they’re feeding their animals. Regardless of the animal type–horses, cattle, goats, alpacas, llamas, sheep, donkeys–we have a feed solution for you! 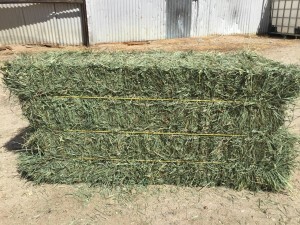 We have a variety of top-notch hay for all the animals in your barn! Looking for feed and supplements? Or vet supplies? We also carry a wide variety of feed and supplements as well as vet supplies for all your pet and livestock needs. Our product line includes the best in the business! Click here for detailed product listing. We deliver to all these areas and more! We deliver by the truckload or by the bale! Whether you’re in San Luis Obispo County, Monterey County, or Santa Barbara County, give us a call.